The incident took place at a Guru Nanak Hospital & Research Centre where relative of a patient furiously threw ink at a doctor at alleging that the doctor refused to attend to his ailing mother who was admitted in the Intensive Care Unit (ICU). The culprit was identified as one Ashok who had approached the hospital with his ailing mother Saraswati Devi, 92, with complaints of chest infection and other geriatric conditions. The patient was admitted under Dr Ashutosh Shahran on April 7. “Since her condition didn’t improve even after a week or so, her son Ashok Kumar Verma (50) met the hospital management on April 17 and requested treatment under Dr Manoj Kumar Dwivedi,” a source told the Telegraph. However, Dr Dwivedi refused to take up the case. 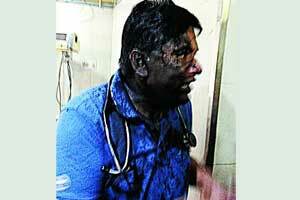 The attack happened the next day when Dr Dwivedi visited the hospital for his morning round. “Around 11.30am, Ashok once again requested the doctor to help his mother, but in vain. In a fit of rage, the patient’s son then attacked the doctor with his fountain pen, leaving the latter’s face covered in black ink,” a hospital employee informed the Telegraph. Subsequent to the incident, the management authorities at the hospital lodged a complaint with the Chutia police station. In the complaint, they have accused Ashok Verma of heckling Dr Manoj Kumar Dwivedi, painting his face with black ink and threatening him of dire consequences. While confirming if any arrest made on the matter, Anil Kumar Karn, the officer-in-charge of Chutia police station stated, “The accused is a resident of Chutia. He has been detained.” He added that the patient’s relative has filed a counter-complaint against the hospital. “The accused also filed a complaint against the doctor and the hospital saying they were neglecting the treatment of his ailing mother who is admitted in the hospital’s intensive care unit,” the officer further added. Dr Diwedi could have seen the patient as courtesy and reviewed the treatment, to appease the families faith. It is the responsibility of the administration of the hospital to have a different dr.to attend the patient when family request .the patient and family are put in the middle the attending dr.doest transfer the care as requested by the family.